Two-time Olympic champion Joanna Rowsell Shand says British Cycling is "one of the best" governing bodies in the world at promoting equality despite the organisation's ongoing crisis. 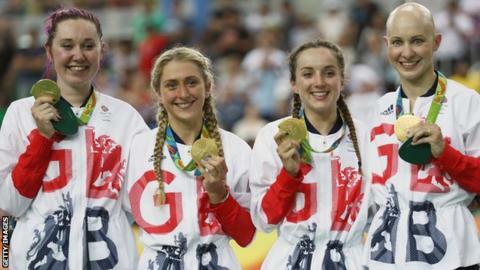 British Cycling has been accused of bullying and sexism towards athletes and is under investigation. Rowsell Shand said: "My experience of British Cycling did not reflect that." But, the Briton said she "did not want to dismiss anybody's accusations" and "everybody should be taken seriously". British Cycling "would never sacrifice medals for welfare"
Last year she said she was "surprised" London 2012 Olympian Jess Varnish claimed British Cycling's technical director Shane Sutton made sexist comments to her. Rowsell Shand won Olympic gold in the team pursuit in 2012 and 2016 before retiring in March this year aged 28. "The sport of cycling internationally still has some huge inequalities between men and women - and that is the same across many sports," she told BBC Sport. "But I think British Cycling is probably one of the best governing bodies in the world at trying to promote equality between men and women. "We would not have won what we won if we had not had the support from British Cycling so for me I honestly feel that my medal was worth the same as the men's equivalent." An independent review into the culture at British Cycling was launched last year after ex-riders complained about their treatment. British Cycling published a 39-point action plan last month to address the draft findings of the investigation and started work on the development of a code of conduct as part of its response. "No organisation is perfect but I think you should strive for perfection," Rowsell Shand said. "British Cycling have already done a 39-point plan of areas they want to improve on which I think it very proactive." However, Rowsell Shand reiterated that her support for British Cycling does not mean that she thinks the accusations are not serious. "I think if somebody feels that they've been bullied it's very easy for somebody else to think it was just banter, but I think these things should be absolutely taken really seriously," she said.